So let’s find out more about the beautiful island of Inis Mór…..
People have for hundreds of years travelled to the Aran Islands to immerse themselves in the language and culture of the community. Well as you know, it is the largest of the three Aran Islands, located off the coast of Co. Galway. An excellent boat service is provided by Island Ferries to Inis Mór from Ros a Mhíl. 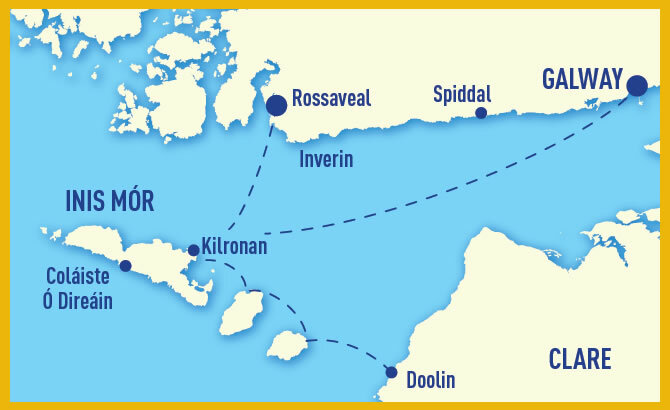 Doolin ferries also provide boat service from Doolin and Aer Aran provide aer service from Inverin. The island is approx 9 miles long and 3 miles wide, and has 14 villages on it. The main village is Cill Rónáin, where the pier is located. The Gaeltacht college named in honour of the poet Máirtín Ó Direáin is based in Fearann an Choirce, in the centre of the island, and student houses are located in many villages on the island. Students living near by to the college will walk to and from their houses, while students living a greater distance will be transported to and from the college on mini-buses. The island has many beautiful sights and places of interest to visit, and students visiting are guaranteed to be impressed. There are many historical sights to be seen such as, Dún Aonghasa, Clochán na Carraige and Dún Eochla. The scenic and rugged beauty of Inis Mór can be found around every corner, especially Poll na bPéist, Clochán na Carraige and Dún Dubh Chathair. A Blue flag beach is a mere 5 minute walk from the Coláiste , and many an hour can be spent here, basking in the glorious sunshine! OK, a blue flag beach can be guaranteed, the sun cannot! Best advice though, is to come and see for yourself! You won’t be disappointed. Coláiste Ó Direáin has organised Irish Language courses on Inis Mór, the largest of the three Aran Islands since 1984. The Coláiste is named in honour of the poet Máirtín Ó Direáin, a native of the Island. Our Gaeltacht courses are fully recognised by the Department of Education, Roinn na Gaeltachta and the national governing body of approved Summer Colleges. Learning the Irish language in Aran will ensure greater proficiency in both spoken and written Irish leading to higher grades. Our Gaeltacht courses foster self-confidence, leadership, personal development and natural fluency in the Irish Language -all in an fun way through spóirt, craic agus spraoi.